In total ‘’The Wonder of You’ is made up of 6 Polymer-gravure etching with lithographic overlay, each one in an edition of 55. Vibrant with hue, the finished effect of each print is that of a resonant tension between the stillness of death and the trembling, iridescent life that the individual butterflies convey. ‘The Wonder of You’ is therefore quintessentially Hirstian, combining the impact of visual spectacle with a powerfully eloquent confluence of medium and visual language. Hirst’s fascination with butterflies derives in large part from the way in which these beautiful insects embody both the beauty and the impermanence of life, becoming symbols of faith and mortality. 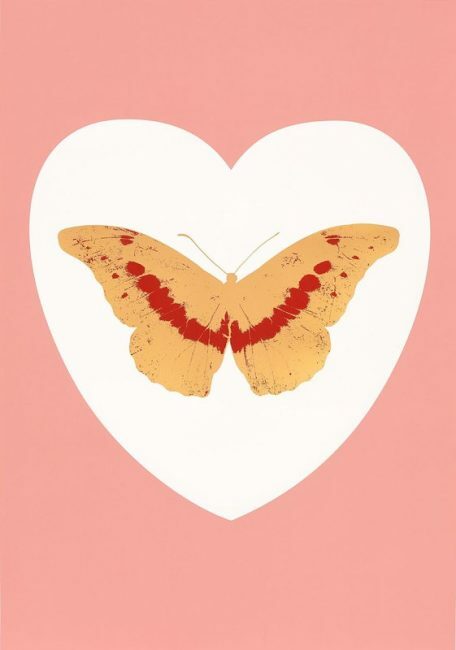 Hirst says, “I love butterflies because when they are dead they look alive. The foilblock makes the butterflies have a feel similar to the actual butterflies in the way that they reflect the light. After ‘The Dead’ I had to do the butterflies because you can’t have one without the other”.